Mandibular joints and Meckel’s cartilage in Alligator. Summer in the Holliday Lab is getting exciting. A busy Spring has resulted in a couple new projects coming out later in the Fall (more later) but we’re deep in new directions in the lab including our first stint into Evo-Devo. Some students and I traveled to Louisiana to retrieve about 100 Alligator eggs to run an experiment this summer on the development of the Alligator chin. We’re keen to understand when and how the chin, or mandibular symphysis develops and pinpoint particular mechanisms and events that occur during its in ovo transformation. Meckel’s cartilage is the cartilaginous rod that provides the scaffold for the ossifying mandible and 1st Branchial arch derivatives in the vertebrate skull. So, in reptiles, it promotes the ossification of the bones of the lower jaw and quadrate and remains as a persistent cartilage throughout life (Top Figure). This is in stark contrast to the mammalian condition in which the cartilage cavitates, aids in the formation of the dentary, 2 middle ear ossicles, and the tympanic ring. This caudal end of the system is better known-with questions involving the evolution and development of the mammalian ear driving many research directions. If you want to read more, I point you to the research of Abigail Tucker and Zhe-Xi Luo, among many others. Cross-section through suture and Meckel’s cartilage and CT-based 3D model of mandibular symphysis with bone, and without showing Meckel’s cartilage and sutural ligament. At the rostral end of Meckel’s cartilage, out at the mandibular symphysis, we find animals doing a couple of different things. More often than not, the two cartilage rods (Left and Right) remain independent of one another and the symphysis is solely a membranous, ligamentous syndesmodial joint that fully fuses in primates, oviraptors, neoavians and a handful of other vertebrates, or may be sutured but unfused (dogs, crocodyliforms) (Middle Fig), or even mobile as in snakes, some lizards, possums and other animals probably. Second, research into the development of the human chin has found that the two cartilaginous rods stick together during development and eventually recede, occasionally leaving small nodular cartilages. Although the 2 cartilages stick to one another, the perichondral layer remains patent. We found a similar pattern in Iguana chins in our 2010 Anat Rec paper on lizard mandibular symphyses. Third, and now to the point. 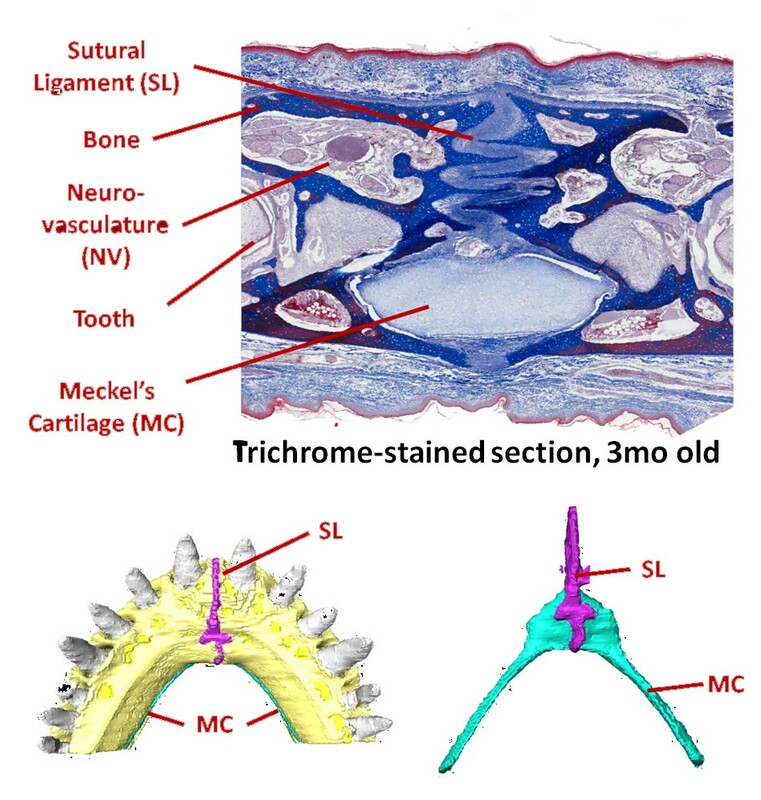 In alligators and geckos, Meckel’s cartilage not only sticks to its opposite member, but it obliterates the perichondral borders between the two cartilaginous rods, forming a continuous cartilaginous rod from the left articular all the way around the chin and back to the right articular. That’s cool! Buy why? Is it adaptive? We’ve got some ideas. How? we’re working on it. Why do we care? working on that too 🙂 but in general, mandibular symphyses are important cranial joints functionally, so understanding their development and evolution are key goals if you want to understand the how the vertebrate head works. Meckel’s cartilage is often entwined in craniofacial defects that affect branchial arch development. Archosaur chins are really cool and quite diverse and thus may shed light on form, function, and ecology of feeding during their evolution. Also, paleontologists have started to wiggle chin joints with more frequency these days, what with various animation and modeling applications, despite there being what I consider a total lack of published research on how the joint is built (my fault I guess) and functions (in the works!) in living reptiles. 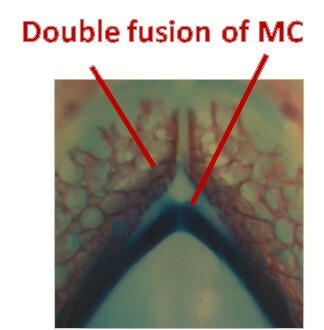 Cleared and Double-stained alligator embryo showing the incipient double fusion and spatulate process of Meckel’s cartilage at the symphysis. I digress… Fourth…Alligators take this cartilage fusion one step further in that a spatulate structure extends rostrally from the main body of Meckel’s cartilage and forms a second fusion which eventually seals up with the caudal, main body of the cartilage. This spatulate form persists throughout life in alligators, leaving a large, flat trough within the bony symphysis. Is this fusion similar to those fusions we see in the hyoid skeleton, or the chondrocranium? probably. We’ll find out. This summer we’re growing up Alligators to capture the time during development when this fusion occurs–I’ll post about that next. This entry was posted in Research News and tagged alligator, cartilage, chin, mandibular symphysis, science. Bookmark the permalink. Casey: In crocodylian evolution (particularly alligatoroids), there’s alot of variation in the dorsoventral position of the anterior part of the splenial with respect to the Meckelian groove, and also whether the splenial enters the mandibular symphysis, and if so, how much it contributes. Do you think the variation in these character states might have any functional significance? Randy. It might. Splenial contributions to the symphysis seem to ebb and flow all the way back into protosuchians–and farther. I’m not sure if having sutured splenials alongside sutured dentaries would really impact how the symphysis proper works since the dentaries typically dominate the joint. However having the secondary articulation caudal to the dentaries may shore up the joint against torsion and wishboning–but you can do that by increasing the dentary contributions too. So, instead having sutured splenials may have more to do with what the intramandibular sutures are sensing since the splenials are such a large contributor to that joint. Given the amount of long axis rotation many croc and archosaur mandibles experience, having the internal brace of the splenials may serve structural and proprioceptive purposes–not to mention simply protecting Meckel’s cartilage as it passes up towards the chin. Awesome – thanks for such a detailed explanation! I look forward to hearing more about your croc jaw joint stuff in the future. I found it on 23 spot. You can reach google top-10 easily using one useful wordpress plugin and increase targeted traffic many times.